Home » Uncategorized » The Top 5 Psychological Sins! The Top 5 Psychological Sins! For returning readers of this blog, you might have noticed a theme with a few of my posts. Psychology finds itself at odds with common folks’ ideas from time to time, and with the misinformation coming from popular media. Today, I cover my personal top 5! Keep in mind – this list only reflects my personal opinion! 4. So you’re a psychologist? You’re not going to psychoanalyze me are you?! This comment wears you out after a while. First, I’m not a trained counselor, and I’m not a clinical psychologist. I focus on personality and social psychology. I do understand how to look for maladapative reasoning and looking for motivations of behavior, but any observant person can read into behaviors. Every psych student will hear this “joke” at some point. The problem? Psychology has 56 divisions (http://www.apa.org/about/division/index.aspx). Personality and Social Psychology make up one division, but what other divisions exist? School psychology, developmental psychology, GLBT studies, psychology of substance abuse, evaluation and measurement, clinical psychology, counseling psychology, educational psychology… you get the idea. A large portion of psychology students tend to go into the clinical and counseling fields, but psychology goes far beyond therapy. If an action involves thinking, a psychological specialization probably exists! 3. Psychology? Oh, so you can prescribe me the good pills right? I understand people get psychiatry and psychology mixed up sometimes. Even my own family makes this mistake, and I don’t really hold it against someone who switches them around. The problem? Psychiatry is an M.D. track, which requires medical training. A psychiatrist is not always trained in “talking therapy” but they can diagnose and treat disorder with medication. As much as we like to think our willpower can overcome all disorder, sometimes it cannot. When chemical imbalances occur, medication can help. As for a counselor, he or she is more likely to engage in therapy to resolve maladaptive behaviors and schema. For non-counselors like myself, my recent work tasks me with drafting research methods and how to produce valid and actionable results from survey data. 2. Oh, so why is it I always “insert behavioral quirk” I’m SOOOO OCD! When folks hear I come from psychology, they share strange stories about themselves with me. Someone shared this story recently, “I always check to make sure I didn’t lock my keys in the car, like, 4 times before I lock and shut the door. My OCD drives me insane.” A lot of folks label their normal human behaviors as disorder, and I suppose it might be because they think the behavior in question is highly abnormal when it is mundane. The problem? That’s not OCD. In my clinical days, I worked with patients suffering from OCD. They did things like continually wash their hands until they bled. They opened and closed their doors 47 times before they could go to bed otherwise they did not feel safe. They fixated on completing their tasks and failure to do so caused them incredible distress. Checking to make sure your keys are in your pocket a few times is normal human behavior. When people call their normal behaviors disorder, it does get under my skin, and it minimizes those who suffer from the disorder. In most cases, they do not realize what it is like for those who truly suffer from the illness. The biggest offenders claim to have ADD, OCD, and bi-polar disorder. It amuses me that some folks confuse bi-polar disorder and disassociative identity disorder (DID). DID is characterized by multiple personalities that may or may not have access to the memories stored by other personalities, resulting in memory black-outs between “alters”. Bi-polar disorder, on the other hand, is swinging from states of high energy -mania to low-energy depression. The shifts from highs to lows with bi-polar disorder are not necessarily rapid either. Some folks tend to stay in one stay for a prolonged period, then shift into the other for an equally long period. 1. You know how we only use 10% of our brain? The problem? If 100% of the vehicle’s mass were dedicated to combustion, you wouldn’t be able to sit in it, steer it, have any safety measures, or capacity to carry anything. It would no longer be a car, but simply a bomb. Each part of the car has a function, and damage, or removal, of these parts causes the overall functionality to be impaired, or the machine may cease to work all together. Every single part of the brain isn’t even labeled in the second image, but it should be abundantly clear what’s happening. The brain is not just a big box where thinking happens, it’s where almost EVERYTHING happens. Conscious thought, and self-awareness as we know it only really occur in the prefrontal cortex. Memory and storage occur closer to the mid-brain, near the Olfactory cortex (specifically the basal ganglia and hippocampus). If you remove a part of the brain, you end up with a very different person. Henery Molaison, (typically noted as H.M in research text) had his hippocampus removed to attempt to stop severe seizures. He stopped having seizures, but he also lost the ability to store any long term memories. Phineas Gage had a terrible construction accident which removed a large portion of his prefrontal cortex. Some authors claim he lost the ability to manage himself, he became impulsive, quick to anger, and unable to organize anything. In North American Football, some head injuries resulted in damage to the fusiform gyrus. 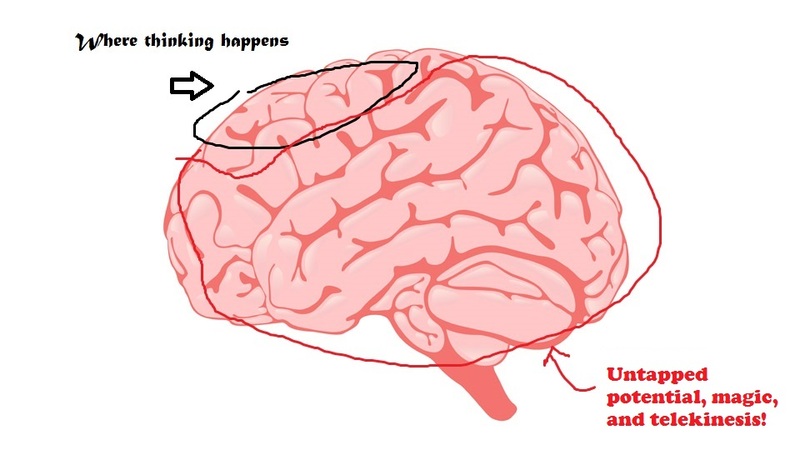 Damage to the fusiform region (home of the “fusiform face area”) leads to face blindness, or prosopagnosia. Prosopagnosia is the inability to remember of distinguish faces. Just imagining picking up your child from school, or day care, and needing someone else to tell you which one of the children is yours. Every part of the brain is important! The problem? Popular media likes to use the 10% myth as the basis for their works of fiction. Here’s a listing of a few who commit this psychological sin provided by TV.tropes! This concludes my personal list of the “Top 5 Psychological Sins.” Please feel free to share some of your favorites in the comments! By psychddouglas in Uncategorized on June 29, 2014 . Oh, #4 . . . #4 kills me. I’m an organizational psychologist, so no, I’m not psychoanalyzing you, and even if I were a clinician, I’d probably not be doing my professional job in this casual conversation with you, stranger. I’m glad to hear I’m not the only one who gets these responses.